It tells the story of an orphan and his growth and personal development. Dickens was torn about how to complete the novel so he wrote more than one ending. Carson Wentz is the lead character in the latest chapter of Eagles football, an organization that has gone 56 years without winning a championship. While Wentz is far from an orphan, he was drafted №2 overall from a tiny school in North Dakota that most people in Philadelphia had never seen play a down of football. Like Pip, Wentz’ 2017 season is about growth and personal development. So how great should the expectations be for the kid from Fargo? Great growth and development should also mean great expectations. The cynical Eagle fan might surmise that it is best to expect nothing and then they won’t be disappointed. This Wentz kid is different than most and more special than most. This year you will be more pleasantly surprised than fatally disappointed. Every time I speak with an Eagle executive who is responsible for evaluating talent and building this roster the conversation ALWAYS comes back to Wentz. Actually they never say Wentz by name. They simply say that “we have 11.” In other words, in Wentz they trust. When pressed to say more about Wentz, they simply say that it’s everything. The work that he puts in. Quality work. It’s the time, as long a day as any employee puts in. The interaction with all teammates and the sincerity of those interactions. He is a complete self-starter and never needs to be told where to be or what else needs to get done. He already knows that. The insatiable appetite to get better and to be great is a knowing purpose that can’t be qualified. When it comes to expectations he simply wants to be GREAT, and no price is too high to accomplish that. When Doug Pedersen and the coaches who accompanied him to his private workout at the Fargodome prior to him being drafted back in March of 2016, he was already out on the curb with a bag of balls and some spikes to workout waiting on the Eagles to work him out. Before the sun came up he was mentally ready to blow the doors off the Eagles coaches and scouts. When I spent time this spring with Eagle safety Malcolm Jenkins, who has one Super Bowl ring with Drew Brees in New Orleans, he told me that he has every single trait that Drew Brees possesses. He said he can be Drew Brees. And that’s from a perspective of a star defensive player who has lined up opposite Drew Brees and Carson Wentz in practice every day and sees the special qualities that only a few of the QBs possess in any decade. The Eagles front office sees these qualities. Alshon Jeffery and Torrey Smith, and the rookie additions of Donnel Pumphrey and Mack Hollins and Shelton Gibson are a pretty good haul considering the dismal salary cap situation they found themselves in at the end of the ’16 season. There are a couple of immediate areas where we can follow Carson on the road to great expectations for both him and the team. He must become more accurate with throws 10 yards or more. Some of that will happen automatically as he is now surrounded with better players than the group he played with during his rookie campaign. The incessant drops should be fewer and the routes and who he trusts to run those routes should be far superior to any game he played in a year ago. He has yet to secure a fourth-quarter comeback. Never underestimate this statistic for quarterbacks. While it is the ultimate team game, it still falls on the QB’s shoulders to find ways to win games in crunch time. Think back to week four last year in Detroit where they surrendered a fourth quarter lead because of a fumble by Ryan Mathews. But Carson still had a chance before an interception by Darius Slay Jr. foiled that attempt. Then there were back-to-back heart breaking defeats to the Giants and Cowboys in the middle of the season. Against Dallas they were up 10 points in the fourth quarter on the road in front of a national TV audience that slipped away. Later in the season they had a great chance to upend the Ravens on the road and could not make plays at the end to pull out a mild upset. Those were four possible wins that could have made a good debut a great debut. When he pulls out his first fourth quarter comeback this year a graphic will immediately appear on a lower third of the man cave TV set you are watching on that will inform you. 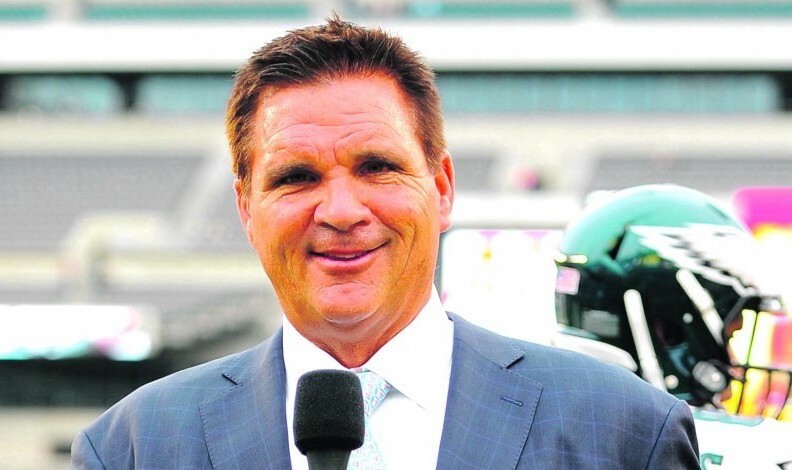 While you are informed, Carson will be relieved and that 100 watt incandescent smile of his will be a beacon of joy on the Eagle sideline. If the Eagles can enter the toughest stretch of their schedule 8–5 before they face the Giants and then on Christmas night they face the Raiders followed by the Cowboys only six days later, I think it could be the most exciting Eagle season in a long long time. With an 8–5 record going into that stretch it would ensure at least an 8–8 season and the possibility of an 11–5 season. But they can’t get to 8–5 without great play from Carson. Whether it’s looking at NFL stats and seeing Wentz among the leaderboards or listening to the new analytic kids who are breaking down every throw into some newfangled measurement, he will have to be an improved player at that point. The highest expectations are reserved for those players who are true franchise players. Tom Brady, Aaron Rodgers, Ben Roethlisberger, who make everyone in their organization better. They make them better by making five throws in almost every game that no one else can make. They make everyone better by converting on the toughest third- and fourth-down plays that no one else makes and keeps a weary defense off the field. They manage games differently week to week to help cover up the weaknesses. They exude leadership via their actions especially when a team is in the toughest predicaments. This is a special club that awaits Carson. If Dickens were to write the script for the Eagles 2017 season I hope that his title, “Great Expectations,” were met by even the most cynical of fans. And I would hope that Dickens would only need to write one ending that leaves all Eagle fans with hope; the type of hope that leaves all fans of all ages believing that the Birds can end this 56-year old drought without a championship. Wentz, like Pip, is a season of growth and personal development.